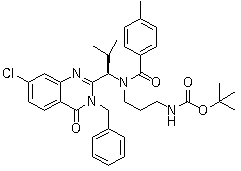 AZD4877 is a synthetic kinesin spindle protein (KSP) inhibitor with potential antineoplastic activity. ARQ-621 is an allosteric, potent and selective inhibitor of Eg5, a microtubule-based ATPase motor protein involved in cell division. Dimethylenastron is an Eg5 inhibitor, which arrests cells with monopolar spindles to which all chromosomes attach in a syntelic manner. 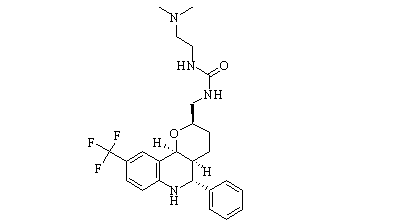 EMD534085 is a kinesin inhibitor currently in clinical development. Monastrol is a potent and cell-permeable inhibitor of the mitotic kinesin Eg5 with an IC50 value of 14 μM. Monastrol is a kinesin Eg5 inhibitor. Induction of apoptosis by monastrol is independent of the spindle checkpoint. Ispinesib (SB-715992, CK0238273) is a potent, specific and reversible inhibitor of kinesin spindle protein (KSP) with Ki app of 1.7 nM, no inhibition to CENP-E, RabK6, MCAK, MKLP1, KHC or Kif1A. ARRY-520 is a synthetic kinesin spindle protein (KSP) inhibitor with IC50 of 6 nM. Novel drug candidate for the treatment of cancer, GSK-923295, is a small-molecule inhibitor of the mitotic kinesin centromere-associated protein E, (CENP-E). K858 selectively inhibits Eg5 ATPase activity with an IC50 of 1.3 μM.